We’re at 9 weeks this week according to our doctor. We had our first doctor’s appointment, which was very uneventful. I had a pap test…fun! And, at least we were able to hear that all the tests so far show we are a-okay. We’ll have our first ultrasound in about a month. We could have done it a bit sooner but A will be out of town for school and I just can’t imagine doing it without him. I’ve been feeling a bit more pregnant lately. Mornings, as expected, are worse than other times of the day since I haven’t eaten for a longer period of time. However, I do feel pretty sick the entire day. It isn’t bad enough to stay home but just bad enough for me to not feel quite myself. I try to eat six small meals a day, but that is even hard since I really just don’t feel like eating. I still go to the gym and that actually helps a lot. It is difficult to get myself there, but once I’m there I feel so much better. I have my first set of cravings…ice cream bars, guacamole, chicken and tuna salad, peanut butter, and fruit, fruit, fruit! I can’t seem to get enough fruit, especially peaches, grapes, and pineapple! It’s the only thing that ever sounds the least bit appetizing. I’ve also had my share of food aversions. These are strange because it’s things I actually really love- scrambled eggs, bbq sauce, anything grilled, and coffee. Yes! Coffee! I’ve had to switch to tea. It’s all so bizarre to me. As you can see, there isn’t much change. My stomach looks a little fuller to me, but I really think it’s mostly a pizza baby in there because of dinner last night. The baby is the size of a green olive this week. It has also graduated from embryo to fetus. Yay baby! Congrats! He or she is developing his/her head, muscles and little baby limbs. We’re in the last month of the first trimester…exciting! It’s been a strange and crazy few weeks, but in all the madness somehow A and I managed to get ourselves a little surprise. I’m not sure even how to start all this since it is all new, exciting, and scary at the same time. We found out only a few weeks ago and have just started the process of doctor visits. I’ve been told that I could be anywhere from 6-8 weeks. I won’t know for sure until my first ultrasound, which will most likely happen in the next couple weeks. I’ve gone through blood tests and a whole lot of paperwork. Who knew that there were so many waivers to sign?? Just kidding! There is no baby bump yet! 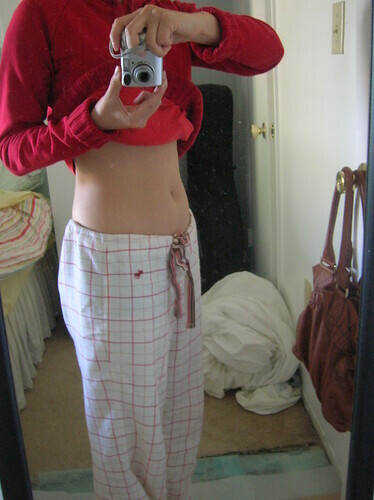 The picture is more to remind me that my stomach was once flat. According to my book the baby (if at 8 weeks) is about the size of a raspberry. So very small yet causing me a bit of disturbance. I feel fine for the most part. Last night and today have been the only hint of morning sickness I’ve had. I described it to A as having a constant hangover that you just wish would go away. I feel a little off- hungry but food doesn’t sound good, tired with a dull headache, crampy with a backache. No fun, but I know it could definitely be worse! I also have this strange heightened sense of smell! A calls it my new super power. Everything smells ten times stronger- from my face soap to the trash. It all drives me a bit bananas! Everything is good so far! My next doctor appointment will hopefully be a little more informative. I’m constantly worried and anxious, but I’m sure once I ease into this it will all become less stressful (or not). Just taking it one week at a time.